The years 2017 and 2018 marked the advent of a number of novelties in the field of additive marketing with the arrival of new stakeholders, new technologies, materials and applications and an increasing number of users. The period marked the maturing process of associated technologies. And metal printing became a mandatory step in solving specific manufacturing problems and in creating new and complex end products. Sirris has been keeping a watchful eye on these developments. Here are the major trends in metal 3D printing machine evolution, illustrated by a few examples. Additive Industries (Netherlands) proposes its entirely automated MetalFab 1 system, comprised of an assembly of different modules (printing, heat treatment, removal, etc.) between which a robot on rails moves the manufacturing plates. 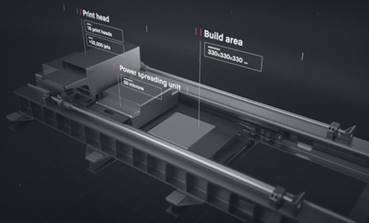 The fusion laser block can slide towards a second printing unit during finishing operations in order to boost productivity. Post-machining on the same machine is one way to ease integration of additive manufacturing in your production process. Leading machine-tool manufacturers such as Matsuura and Sodick have, for a few years, been proposing hybrid equipment combining additive and subtractive manufacturing, the efficacy of which has constantly increased. Additive manufacturing equipment is not exclusively limited to printers. 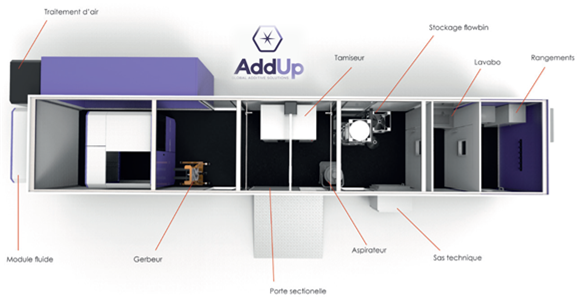 AddUp, a joint venture between Michelin and Fives, proposes an integrated solution that takes account of the health, safety and environmental aspects of additive manufacturing. Its manufacturing machine is embedded within a container with compartments including powder recycling and part removal zones, a 'cloakroom' zone to avoid outward contamination and an air treatment zone. Suppliers from the standard manufacturing industry develop associated equipment to complete the ecosystem around printers. For example, Klaeger offers a bandsaw for separating printed parts from their production plate. Solukan markets a glove box system for removing powder from parts after SLS (Selective Laser Sintering). Assonic in turn sells a conditioner to filter powder for recycling and to mix it with fresh material in required quantities. Seivgen produces a fast and autonomous powder filtering system. Powder bed fusion processes (EOS, SLM Solutions, Concept Laser (acquired by GE), Renishaw, 3D Systems, etc.) have been drastically improved. Machine size has increased (up to 800mm plate length), as have work speeds. Notably, monitoring systems have been increasingly integrated. Most often, they consist in measuring the radiation of the bath as well as the laser strength effectively delivered. They are not, as yet, able to correct machine parameters in real time, but are designed to ensure the quality of produced parts whilst guaranteeing constant manufacturing conditions. Over and above powder bed fusion processes, other techniques are being developed or professionalised. They all aim to reduce the cost of printed parts in order to bring additive manufacturing within reach of a larger number of applications. Cold spray, a well-known 2D coating method that relies on gas acceleration at supersonic speeds inside a nozzle, is making a breakthrough in the 3D world. For example, Spee3D (Australia) has developed a cold spray technology on a robot arm, enabling copper and aluminium parts to be produced with a flow rate of up to 100 g/min. A range of jetting techniques offer an alternative to costly lasers and increasingly fine detail. 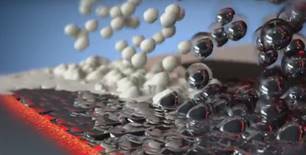 For example, the Israeli company XJet provides a machine that projects metallic nanoparticles, suspended in liquid. Liquid evaporation followed by fritting offer parts with their final cohesion. Digital Metal, part of the Höganäs group, a user for the past few years of a binder jetting system for the subcontracted production of small precision components, is now marketing its own machine. Fritting is conducted during the post-production phase. Desktop Metal Production is also based on the projection of a binding agent, yet the 'Single Pass Jetting' process, which integrates several functions in one single passage of the print bar is said to be 100 times faster and 20 times cheaper than equivalent systems on the market. Fritting is also conducted post-production. Other technologies, such as ECN, fuse particles using a laser immediately after liquid evaporation to avoid the drawbacks of fritting. The Desktop Metal Studio is a compact printer relying on a rod extrusion technology using metal powder and a binder and referred to as Bound Metal Deposition (BMD). To facilitate removal, a specific process consists in printing an interface layer between the part and the base, to prevent them from becoming attached during fritting. This process is conducted in an oven combining heating cartridges and microwaves. Markforged also employs a process of extrusion of a metal-loaded filament in its Metal X machine, used to manufacture – after fritting – metallic parts in a range of alloys. The same principle has been adopted by AIM3D and 3D-Figo, but rather than using a filament, directly using powder via MIM (Metal Injection Moulding). 6. So what about Sirris ? Given the great diversity of techniques and equipment, keeping up to date with the latest advances in the field of additive manufacturing is an arduous task. Sirris has been exploring the field since 1990, by honing in on the latest information, then by processing, filtering and disseminating it. You can consult detailed information on the technologies and advances described above on our Techniline watch portal. 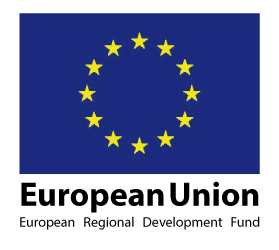 Furthermore, thanks to its vast range of equipment covering the entire production process, its projects with European partners in all technological fields and its regular investment in new material, Sirris can also test and perfect processes, products and business models. Whatever your project, at Sirris, you are sure to find an expert to offer you objective and neutral advice and to help you develop your project.